Black Watch Tartan Ribbon is available to buy in 7mm (1/4"), 10mm (3/8"), 16mm (5/8"), 25mm (1"), 38mm (1½") and 70mm (2¾") widths, on 25 metre (approx 27½ yard) reels. New 100m (110yd) spools als available - watch this space. Black Watch Tartan Ribbon is also available in 12mm (1/2"), 24mm (1") and 38mm (1½") widths on larger 50m (55yd) bulk reels. Please note that tartan ribbon supplied 50m bulk reels is from a different manufacturer and stocks are limited. Black Watch Organza (sheer, lightweight) tartan ribbon is also available in 16mm (5/8"), 25mm (1") and 38mm (1½") widths, on 25m (27½yd) reels. Black Watch Wired Edge tartan ribbon with silver and gold edges is also available. This ribbon is now extremely rare and stocks are diminishing quickly but to see what's available please click here. The Black Watch Tartan Ribbon sold by tartan-ribbon.com is top quality, authentic Scottish tartan ribbon as certified by the Scottish Tartans Authority. 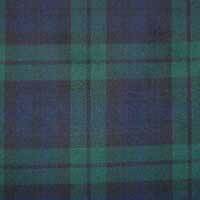 The Black Watch Tartan Ribbon was originally, and remains more correctly called "The Government Tartan", featuring the famous dark blue and green undercheck, on which most military tartans are based.